(Photo: LWF/ Rodrick Beiler)Christiana Figueres, executive secretary of the United Nations Framework Convention on Climate Change, dances with Anglican Archbishop Thabo Makgoba of South Africa to celebrate some 1.8 million signatures on an interfaith petition for climate justice during the COP21 climate summit in Paris, France. 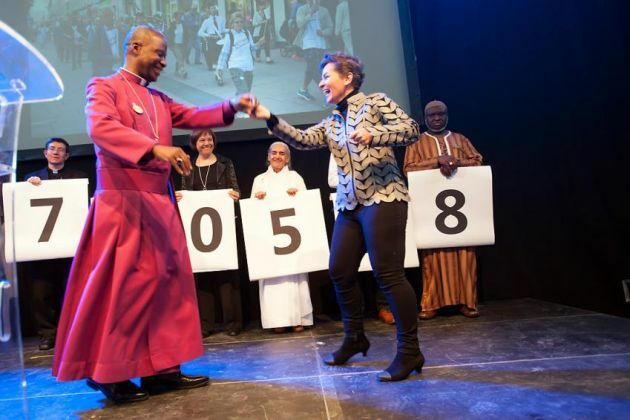 It was a highpoint of ecumenical and interfaith cooperation at COP21 in Paris getting the UN climate chief Christiana Figueres dancing. She had not yet witnessed a climate deal, but received four petitions by ACT Now for Climate Justice (part of ACT Alliance), the Global Catholic Climate Movement, Religions for Peace and Our Voices. She was delighted as she took in almost 1.8 million signatures for climate justice inspiring tears of joy and dancing in Paris. Church leaders attending the fringes of the global climate have longed campaigned to rein in the use of fossil fuels and to combat harmful emissions in a bid to limit warming to 2C (3.6F). He was speaking ahead of the opening sessions of the UN climate talks in Paris (COP21) on 30 November. Faith campaigners presented a total of 1,780,528 signatures gathered worldwide calling for decisive action to curb global warming. The petitions were delivered to leaders of the United Nations COP 21 climate conference beginning its work in Paris. "We can do it together, we must do it together, and we will do it together," said Anglican Archbishop and "ACT ambassador" Thabo Makgoba of Cape Town. "The momentum towards change has come, and it might be stronger than we understand", wrote Rev. Olav Fykse Tveit, general secretary of the World Council of Churches in an Advent message on the eve of the climate talks. After handing over the petitions to UN Framework Convention on Climate Change executive secretary Figueres and Nicolas Hulot, French President François Hollande's special envoy for the planet, Makgoba danced with the climate chief. The faith leaders included Buddhists, Christians, Hindus and Muslims.